I like bags with a strong and simple design — not considerably structured or with a hard shell exterior. This Jimmy Choo Biker Leather Tote fits the bill! 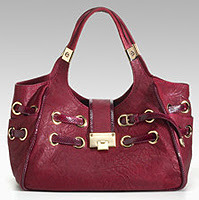 Crafted of subtly textured Italian leather the color of a fine Burgundy wine, luxurious details abound. Gold grommets looped through with watersnake trim, gold key snap hardware, outside pockets for the cell, iPod etc. The only drawback is that it's lined in ultrasuede... a sturdy yet synthetic fabric. Worthy of the $1850 price tag? That's between you and your purse.